Data from a SharePoint list can be used as a data source in PerformancePoint Services. The data from the SharePoint lists can only be read by using PerformancePoint Services; any editing of the data must be done from SharePoint Server. You can connect to any kind of SharePoint list. In PerformancePoint Services, the security settings for data sources are stored in each data source. For SharePoint lists, you have the choice of having all users connect by using the Unattended Service Account or to authenticate using Per-User Identity. Per-User Identity requires Kerberos protocol. We recommend that you select your authentication method before you specify your server connection. Only the default list view is available as a data source or available as a fact or dimension for a KPI or filter. 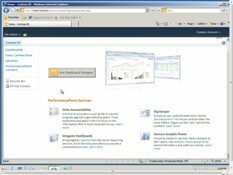 For example, if a column is hidden in the default view, it is not in the list preview of Dashboard Designer. In the Category pane of the Select a Data Source Template dialog box, click Tabular List and then click SharePoint list. Click OK. In the left navigation pane (workspace browser), type a name for your data source. In the center pane, click the Editor tab. In the Data Source Settings section, select the method on which to authenticate to the data source. In the Cache Lifetime drop-down list, type the refresh rate (in minutes) for the cache. Data from this data source will update at this interval. In the Connection Settings section, type the URL to the SharePoint site. In the SharePoint Site List drop-down, select a List collection. In the List drop-down list, select the desired SharePoint list from the collection. Click Test Data Source to confirm that the connection is configured correctly. To view a demonstration of how to create a SharePoint list data connection in PerformancePoint Services, watch the following video.